Paid Member Subscriptions integrates with WooCommerce allowing the admin to restrict product viewing & purchasing and also to offer special product prices to members. 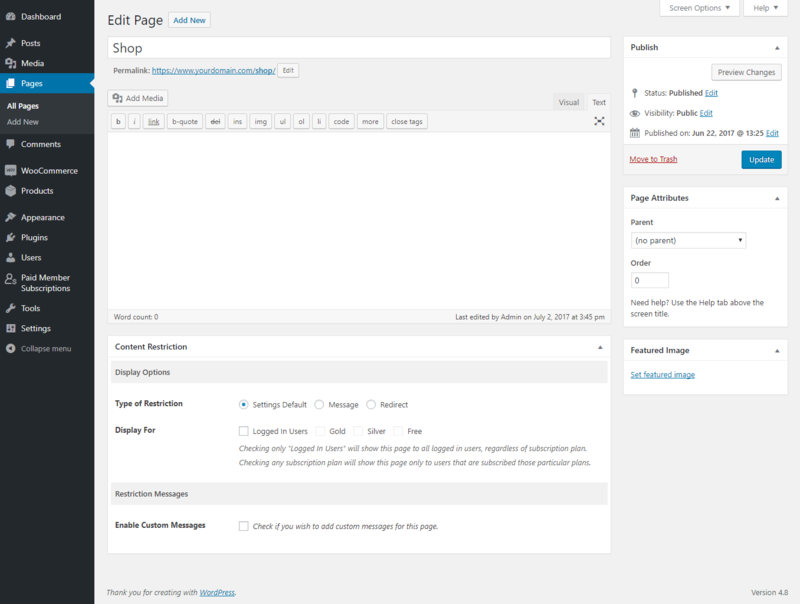 After you activate WooCommerce and Paid Member Subscriptions you will notice a new tab in Paid Member Subscriptions -> Settings page called WooCommerce Integration. 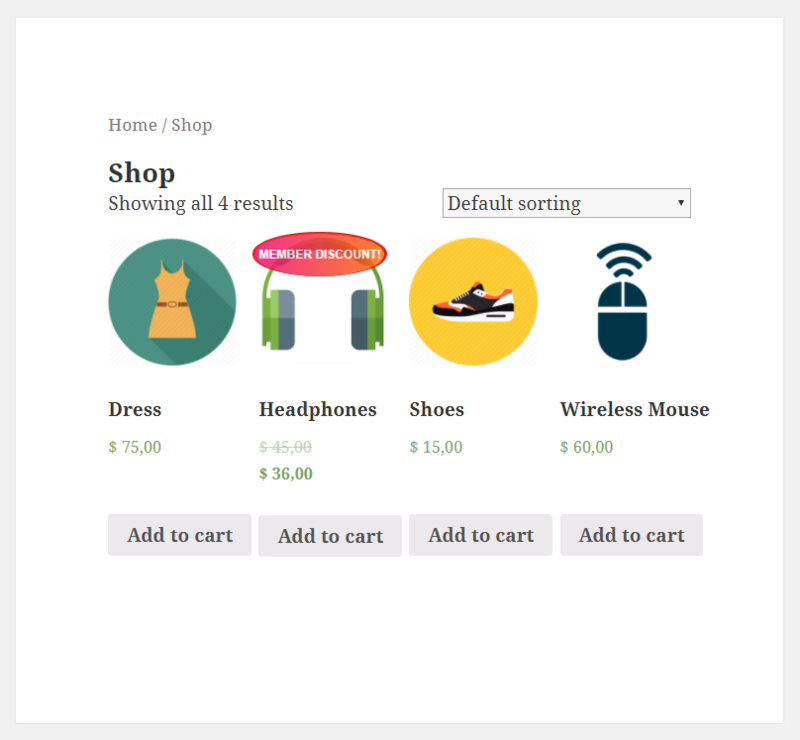 If you want to allow cumulative discounts, meaning to cumulate all the available discounts for the product, you will need to go to PMS -> Settings -> WooCommerce Integration and check “Allow cumulative discounts”. By checking this option we will cumulate all discounts that apply to a specific product. By default we’re applying only the highest discount. We can exclude products on sale if we do not want to apply Membership or Product Discounts to those products. 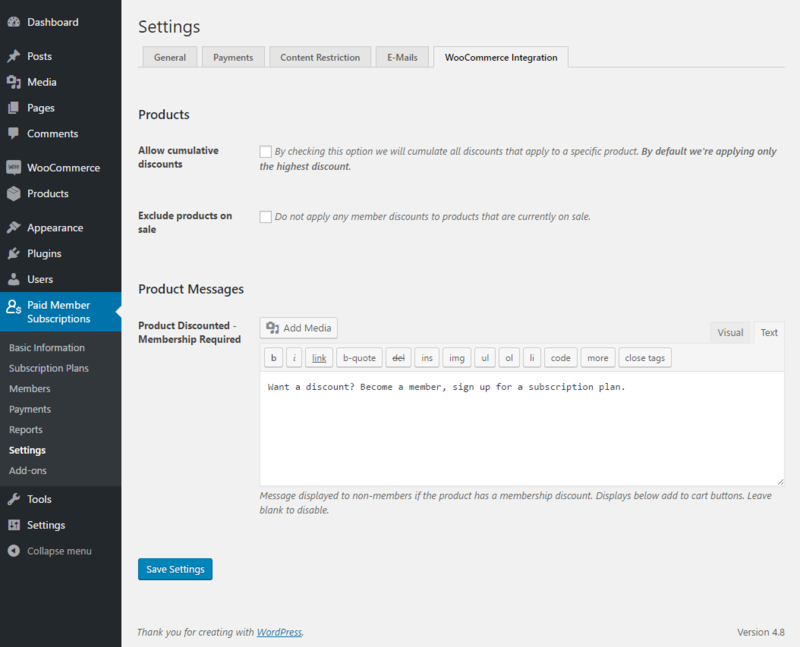 Go to PMS -> Settings -> WooCommerce Integration and check “Exclude products on sale”. We can have products that are on sale and also have membership discounts attached. In our case we have the Headphones product that has the Regular price set to $45 and the Sale price set to $40. For this product we also have a 10% Membership Discount for all the Members that subscribed to the Gold subscription plan. Note – By default the 10% Membership Discount is applied to the Sale Price and not to the Regular price. In our case the $40 Sale Prices will be reduced with 10%. This is how the logged out users as well as logged-in non-members (with no active subscriptions) will see the Shop page and this particular product. There won’t be any price changes for them. This is how the logged in members that subscribed to the Gold plan will see the Shop page and individual product page. The product sale price has been reduced with a 10% membership discount, resulting in a discounted price for the member. You can also notice the “Member Discount” badge that highlights this price change. This message can be used as a call to action for non-members or members who don’t have the appropriate subscription plan, letting them know that a membership discount is available for this product and directing them to sign-up for the required subscription plan. You can modify the default notification: “Want a discount? Become a member, sign up for a subscription plan.” displayed for users that don’t have the appropriate Subscription Plan for a discount, under PMS -> Settings -> WooCommerce Integration -> Product Messages -> Product Discounted – Membership Required. This message is displayed below the “Add to Cart” buttons. Leave blank to disable. Paid Member Subscriptions allows you to offer special discounted product prices to existing members. 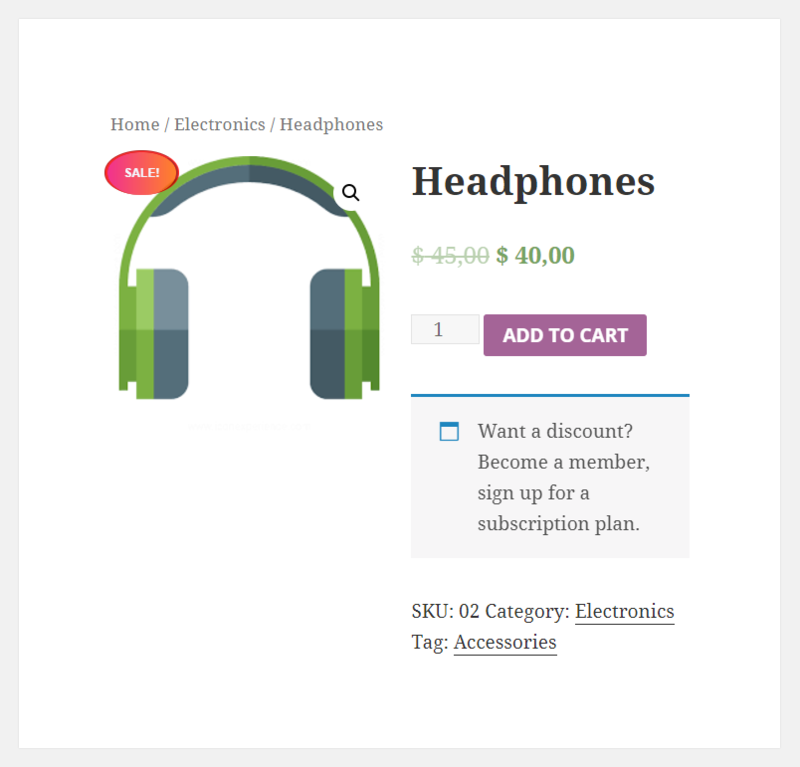 You can set Product Discounts per Subscription Plan or Membership Discounts per Product. Once you have setup discounted member prices for WooCommerce products or product categories, the prices in your shop will change automatically for logged in members. Members will see the special discounted prices based on their subscription plan, instead of the actual price. In order to setup a Product Discount per Subscription Plan you will need first to go to PMS -> Subscription Plans and edit the appropriate Subscription Plan. In our example we are editing the Gold plan. Below the Subscription Plans Details meta box we have the Product Discounts meta box that we can use to create our own Product Discounts. All the Product Discounts added will be applied for users that purchased the subscription plan (in our case the Gold plan). Below, you’ll notice the 10% discount applied to “Headphones” price for logged in Gold subscribers. Logged-out users and members without the Gold subscription won’t see any price changes. 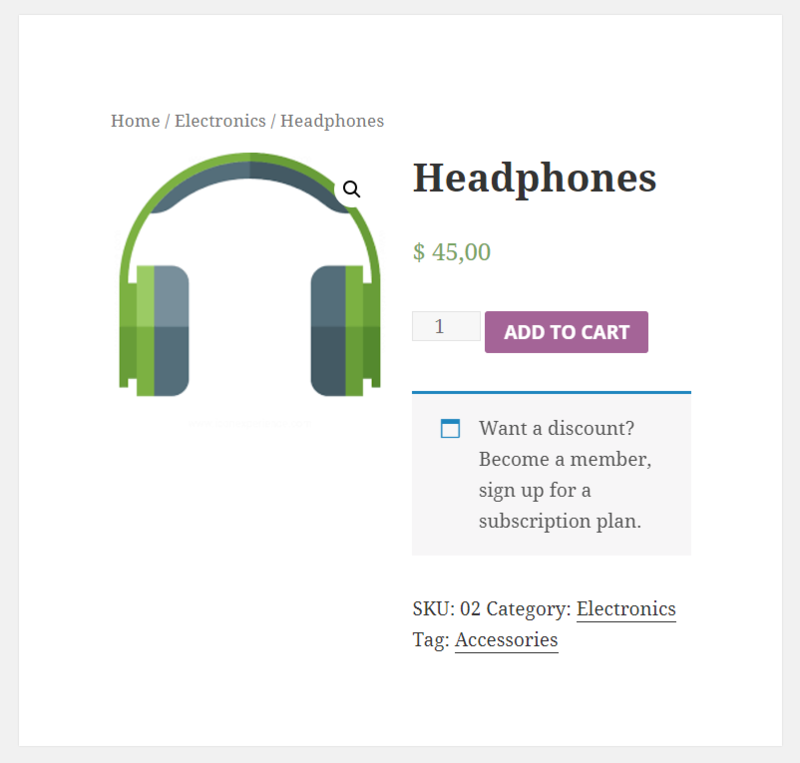 In order to setup individual discounts per product you will need to go to Products and Edit your product. In the Product details page you’ll notice a Membership Discounts meta box. 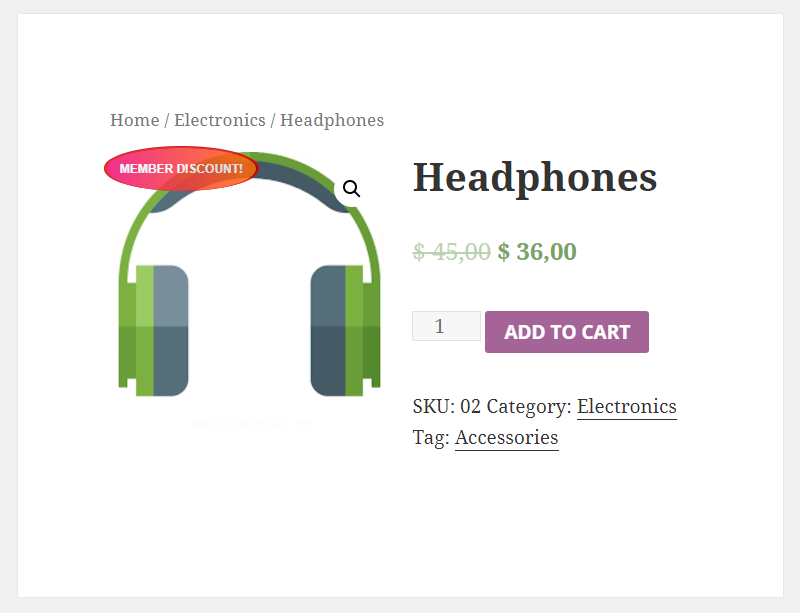 In our example we are editing the Headphones product. When you are using the “Best price” behavior the member that subscribe will see the product discounted by the highest discount. If multiple discounts apply to this product, we’ll apply the highest one, which results in the lowest price. All the Membership Discounts added will be applied for users that purchased the Subscription Plan and in our case the Gold plan. In our example we added a 15% Membership Discount for the Gold Subscription Plan. Below you can see the price chance for Gold subscribers, on both Shop page and individual product page. Restricting Product Viewing allows you to easily create members-only products, as well as allow only certain subscription plans to view certain products. This feature combined with restricting product purchase, offers you a ton of flexibility when it comes to presenting products to your members. Let’s say we have already setup 3 Subscription Plans: Free, Silver and Gold. The Gold plan is the higher plan, since the subscriptions are hierarchical, and the Silver and Free plans are downgrades of the main plan. 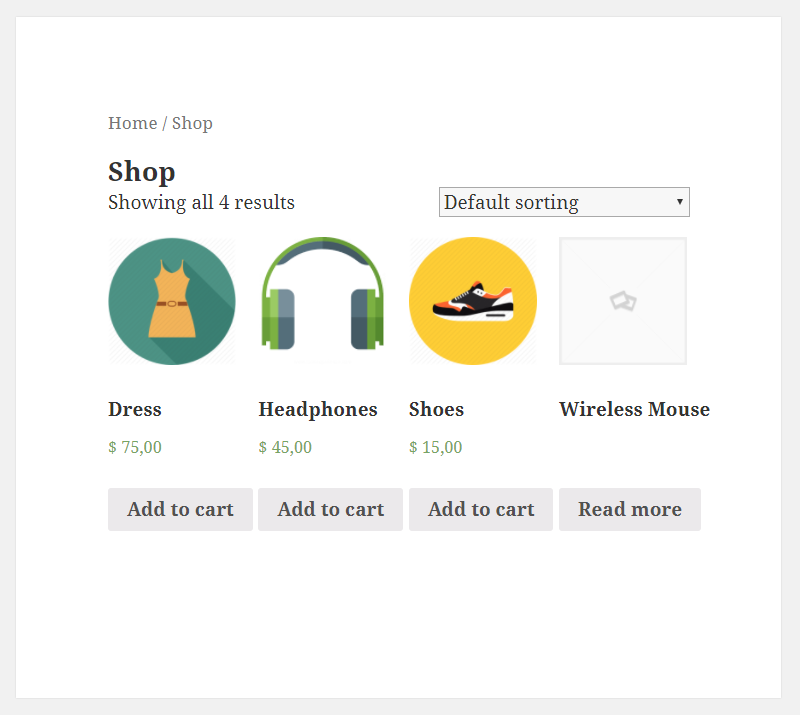 After we setup the Subscription Plans we need to setup our WooCommerce Products visibility. In our case we have 4 products: Dress, Shoes, Wireless Mouse and Headphones which are added in 2 categories: Clothing and Electronics. 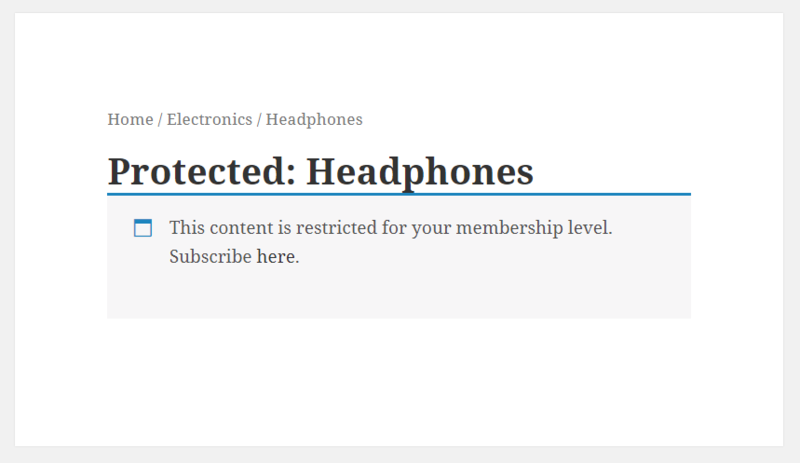 When you edit a product, you will notice a new meta box called Content Restriction. Under the Display Options section you will be able to setup the restriction for product viewing. 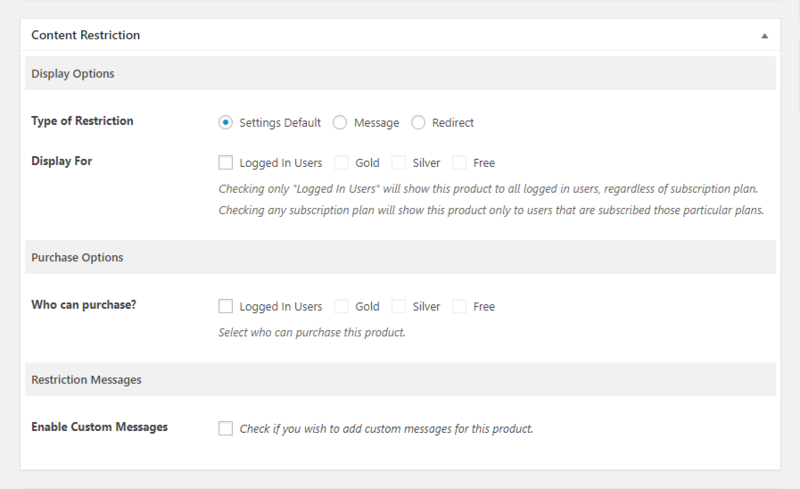 To display a product to all logged in users, regardless of Subscription Plan, you will need to check only the “Logged In Users” option. 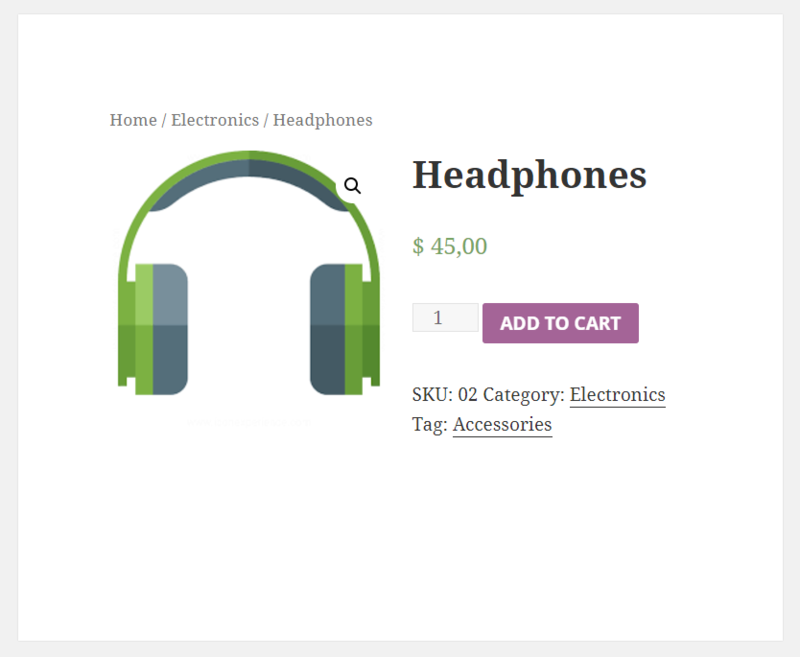 This is how the logged out user will see the product. This is how the logged in user will see the product. 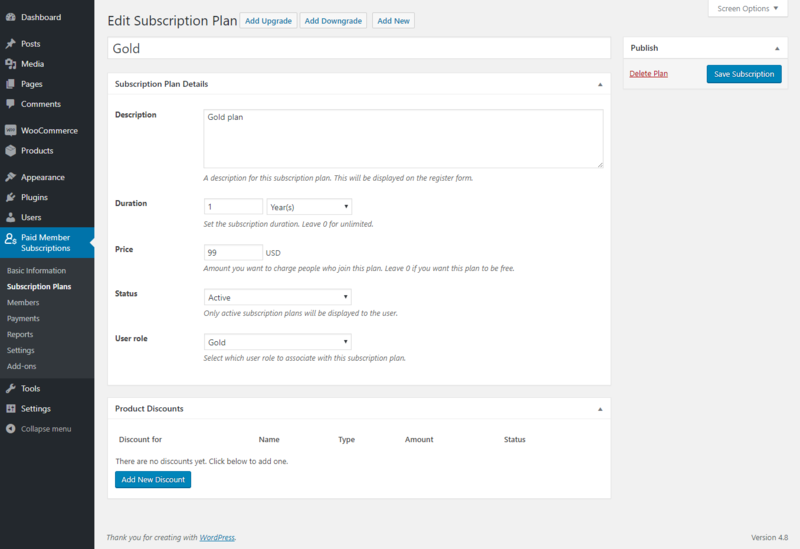 To display a product to all members that subscribed to a specific Subscription Plan you will need to check the “Logged In Users” option and also the Subscription Plan that the restriction will be based on. This is how the logged in user that didn’t subscribe will see the product. This is how the logged in member that subscribed will see the product. Besides product viewing, you can also restrict product purchasing. This way you can allow only certain subscription plans to purchase specific products. 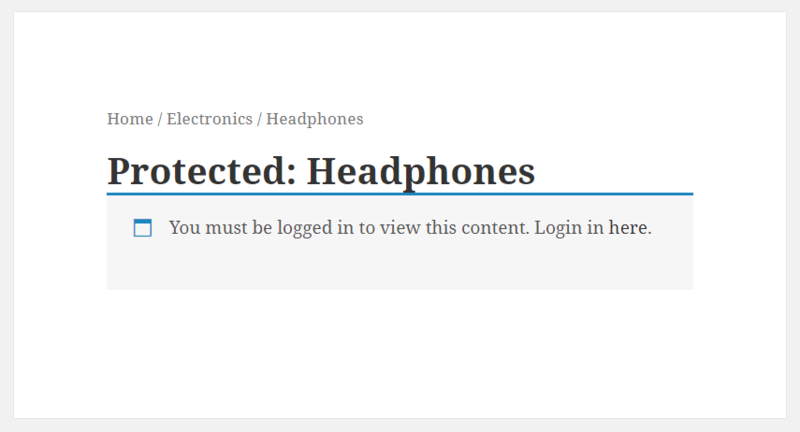 When you edit a product, you will notice a new meta box called Content Restriction. 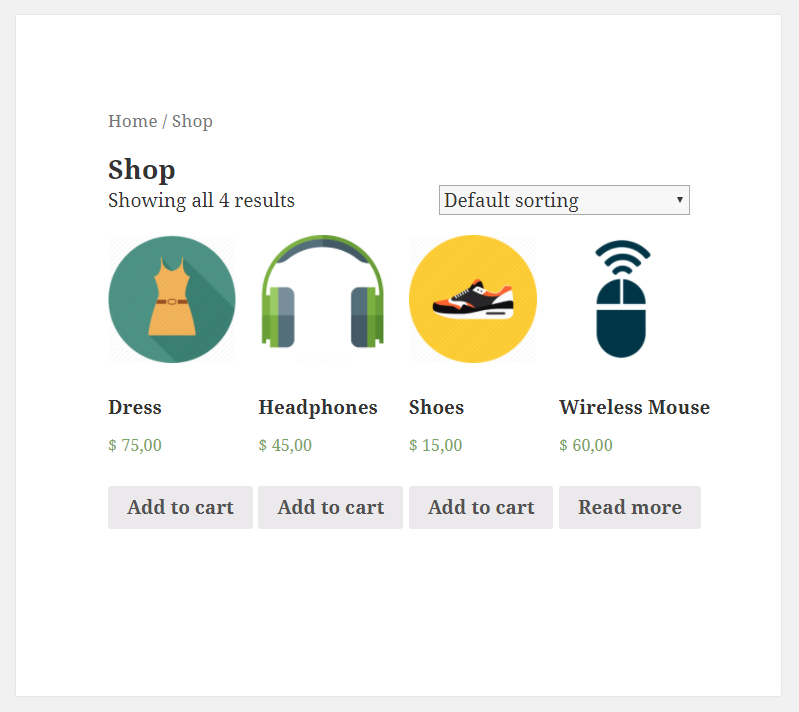 Under the Purchase Options section you will be able to setup the restriction for product purchasing. To allow a product to be purchased only by the logged in users, regardless of Subscription Plan, you will need to check only the “Logged In Users” option. To allow a product to be purchased by the members that subscribed to a specific Subscription Plan you will need to check the “Logged In Users” option and also the subscription plan(s) that will be able to purchase this product. The remaining subscriptions will be restricted from purchasing it. This is how the logged out users or members without the Gold subscription plan will see the product. Gold Members will see the “Add to cart” button and will be able to purchase this product. In order to restrict the access to the WooCommerce Shop page simply go to Pages -> All Pages, Edit the Shop page and scroll down until you see the Content Restriction meta box. 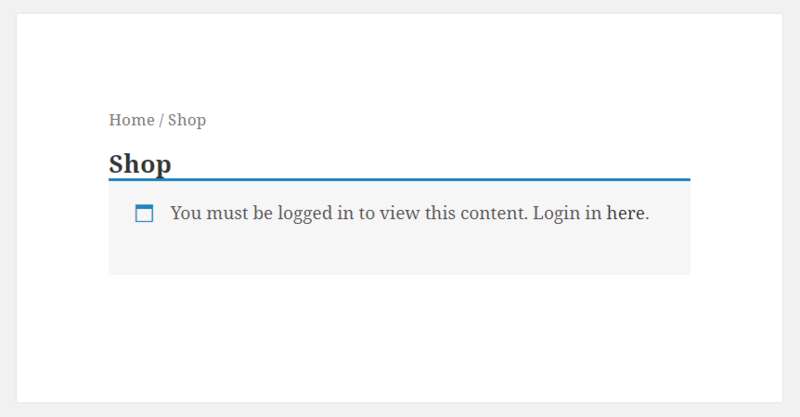 To display the Shop page only to logged in users, regardless of Subscription Plan, you will need to check only the “Logged In Users” option. This is how the logged out user will see the Shop page. This is how the logged in user will see the Shop page. To display the Shop page to all members that subscribed to a specific Subscription Plan you will need to check the “Logged In Users” option and also the Subscription Plan that the restriction will be based on. This is how the logged out user or members with a different membership level than Gold will see the Shop page. Logged in, Gold members will be able to see the Shop page, without any restrictions. As you noticed by now, using Paid Member Subscriptions we can restrict the product viewing and also product purchasing. In the screenshot below, we restricted product viewing for the “Wireless Mouse” product. You only see just the product title, without any details about price, description or thumbnail image. Also the “Add to cart” button is replaced by a “Read more” button. When a member can view a product, but is not allowed to purchase it, he will be able to see all product details, just that the “Add to cart” button will be replaced with a “Read more” button. This way he won’t be able to purchase the product.